My take on the Danish smørrebrød, those artfully presented but unpretentious open-faced sandwiches I saw in Copenhagen. 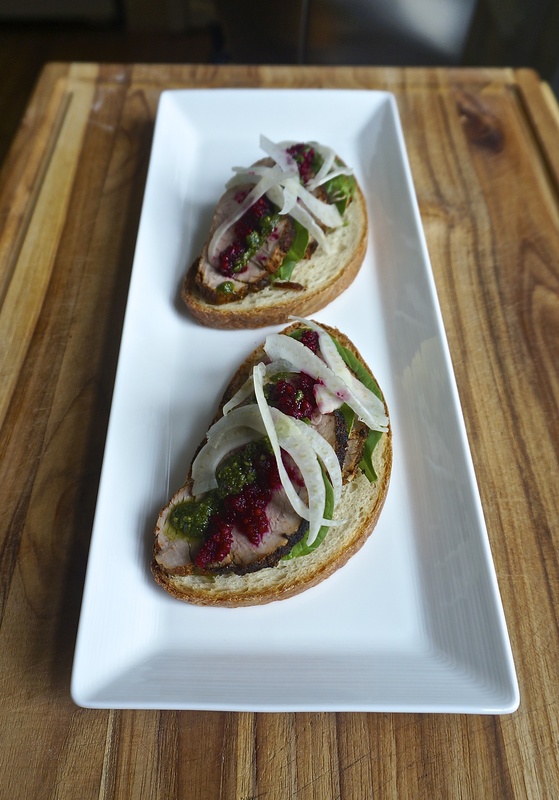 This version uses homemade ciabatta as the base, sliced roasted pork tenderloin in a spice rub, a pickled beet and pickled mustard seed relish, basil pesto, shaved fennel, and baby spinach. Copenhagen is an eye-opening city for food, and no small part of that is smørrebrød, those eye-catching open-faced sandwiches I saw all over the city. Elevated and elegant, they still retained their utility: slices of bread to convey smoked, cured, and roasted fish and meats. When in display cases, they had all of the decadent appeal of pastries, crowned with inviting textures and colors. Smørrebrød offered smart, small pleasures. Their accouterments could be composed as if for a much more complex dish, instead of burying it all beneath another slab of bread. Although café and street food was not what brought me to Copenhagen, it has had the most immediate effect on me. Holly was going to Copenhagen for work; I was going for dinner. It was an amazing dinner. A singular experience. Noma was as innovative and crazy good as it is known to be, but my reactions to the meal we had there definitely need time to process. And that makes sense for Noma, which seems to be all about time, with its attention to foraging, and fermenting, and pickling, and slow roasting, and the ecological and culinary history of a region, and the ecological, economic, and political histories—which is to say stories—of all of the producers from whom Noma sources ingredients, including the wines and coffee. My thinking about food has been transformed by Noma, but what form that transformation will manifest as has yet to show itself (although a start may be the jar of pickled Texas quail eggs that I have seasoning in the refrigerator right now). No, the immediate effect of Copenhagen has been on using condiments and garnishes not as afterthoughts but as part of the pleasure of the dish. Smørrebrød embodied that ethos most visibly, but I also ate many smartly composed sausages, which were enhanced by quality bread and additions like fresh herb oils and various pickles. The flavor combinations for my foray into smørrebrød were inspired by a lunch I had at the Statens Museum for Kunst in Copenhagen. The addition of basil pesto to a dish that already had a beet relish seemed unnecessary at first, more visually stunning than functioning for flavor, but once tasted, the combination of the oil with the vinegar and the complimentary earthiness and sweetness of the basil and the beets were revelatory. I also came across this nice, brief article by Lynda Balslev over at NPR on the history of smørrebrød from an American perspective, with included recipes, found here. The spice rub for the pork is a combination of red chilies, paprika, onion, garlic, oregano, thyme, black pepper, and salt. The pesto is a traditional basil pesto with pine nuts and Parmesan. 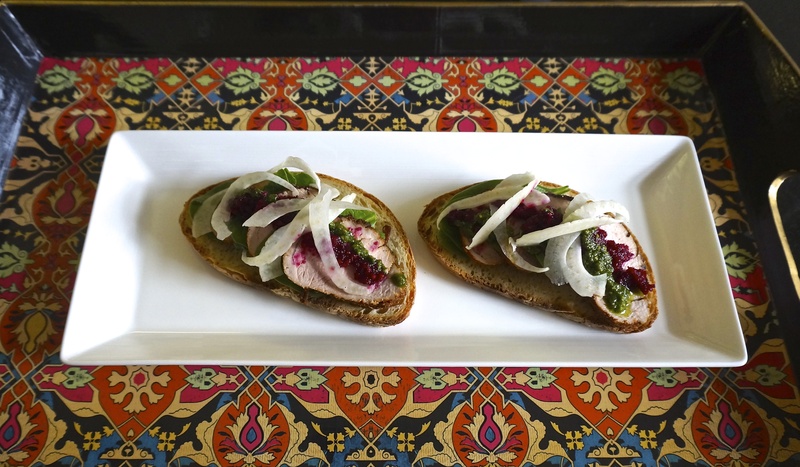 The beet condiment is made by puréeing homemade pickled beets and adding homemade pickled mustard seeds to that.